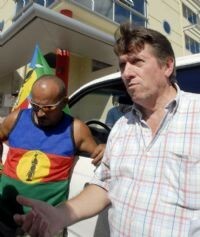 This interview with Gérard Jodar, president of the pro-independence trade union federation USTKE (Union of Kanak and Exploited Workers), was published in Libération, issue #14790, on August 17 2009. He was interviewed by Matthieu Ecoiffier. Translated into English for Links International Journal of Socialist Renewal by Annolies Truman. Sentenced at the end of June 2009 to a year in prison for ``hindering the circulation of an aircraft'' [click HERE for background information to the struggle], Gérard Jodar is one of very few trade unionists to be imprisoned in France –- and his lawyers’ application for a lesser sentence has just been rejected by the appeals judge of the Noumea Supreme Court. Gérard Jodar explains the conditions of his detention as well as the situation on the ``Pebble’’ [the nickname for New Caledonia, the colonial name for the South Pacific territory of Kanaky, which remains a colonial possession of France -- translator]. I’m fine because I’m being supported by a lot of militants, a collective and my family. I’m in Camp Est [Noumea], the only prison in [Kanaky], and this experience is very enlightening. What I’ve witnessed is terrible. First of all, 97% of the prisoners are young Kanaks [the Indigenous people of Kanaky]. The prison, intended for 190 detainees, has 417. There are five or six of us in filthy 11-square metre cells. We’re allowed a half-hour walk in a small yard in the morning and afternoon. There’s no education program in the prison to facilitate the young prisoners’ reintegration into society. We’re only allowed two visits of half an hour each week. The food falls far short of meeting our needs and normal standards. When I think that France is the country of human rights… Well done! A parliamentary delegation needs to come and write a report and back up what I’m saying. From the side of the prison staff, things aren’t any better: understaffed, poor working conditions, the guards are discouraged. We’re still in a colony and not very far from the convict era. What are you accused of ? We’re victims of the brutality of the state through the actions of the Nouméa police and public prosecutor. Since the beginning of 2008 we’ve been attacked twice by several hundred police and mobile guards, although our mobilisations, within the framework of legal general strikes, were peaceful. In the last conflict, that of Aircal [Air Caledonia, a local airline], during the violent assault by police, 28 of us were forced to find refuge inside two planes whose doors were open, in order to protect ourselves and wait for the end of the confrontations. We all went to court, and for exactly the same actions, our sentences range from a fine, through to suspended sentences, to 12 months in prison for the head of our construction union and myself. These decisions are totally discriminatory, if not surreal. We were given no hearing, despite the request of our lawyers, and it was a ``charge-only’’ trial. And now you’re in detention, are you being made into a symbol of resistance to the Caledonian authorities and bosses? To be a symbol isn’t one of my ambitions. Above all, I want to be and remain a militant who fights for greater social justice, for a fair and effective sharing of wealth, for a redistribution in favour of the Kanak people and for the construction of a multicultural country within the framework of a community with a future. Unfortunately, here, it’s easier to make a politician’s speech than to show sincerity and intellectual honesty. Most of the bosses don’t like the USTKE because our union doesn’t hesitate to mobilise its members or denounce the aberrant distribution of wealth. A quarter of the population lives below the poverty line while another part lives in opulence and luxury. According to the high commissioner [colonial governor]of the [French] Republic, Yves Dassonville, ``Aircal was a pretext. What USTKE was really trying to do was create tension’’. What do you think of this statement? Certain people in our country have to stop fantasising. Since I’ve been in prison, I’ve heard a lot of rubbish about this conflict. If, as we had hoped, the negotiations had started at the beginning of the strike, and not several months later, the conflict would have been resolved straight away, and nothing of what happened would have taken place. But, as I told you, we mustn’t overlook the fact that we are a pro-independence union and that the state, the bosses and the local right wing dream of only one thing, to see the USTKE disappear. There too, they’ve got to stop fantasising. José Bové has accused Yves Dassonville ``of throwing oil on the fire’’. Do you share this analysis? Do you think Dassonville should keep his job? In 30 years, I’ve never seen a high commissioner give such brutal instructions or speak in such an extreme way, on the pretext of maintaining law and order. We’re not in a country of thugs, as he likes to call us. He hasn’t considered our country’s culture and that’s serious. It would be preferable for him to be tranferred elsewhere and for someone more diplomatic to take his place. As the conflict worsened, contingents of young people were observed alongside the USTKE. How do you explain this common front? First of all, I’d like to denounce the high commissioner’s statement that the USTKE enrolled and armed the youth to use them against the state to destabilise the country. Another declaration which illustrates his lack of awareness of reality. I’d also like to say that I condemn the vandalising and looting of businesses and public facilities. I’ve had the opportunity to mix a lot with young people: they don’t believe in contemporary politics anymore, they no longer have confidence in [political] institutions and they have no job prospects. When one no longer has hope in the future, or even has a future, then one reacts by reflex! When they see unionists getting bashed by the police, when they hear the extreme language used against [the unionists], what do young people think? Let’s fight next to them, maybe it will create an awareness which could bring about a behavioural change in our favour. The youth is the future of the country, to keep it out of the equation is to ruin any hope of living [together] in a country where there would be a place for everyone. What do you expect from the French government and Marie-Luce Penchard, the secretary of state for overseas territories? The French government needs to fully respect the provisions of the Nouméa Accord of 1998. These agreements have to lead to real decolonisation, and it’s therefore fundamental that sincerity prevails in this process. If the Kanak people and the country’s citizens feel betrayed, their reactions will be strong. Marie-Luce Penchard came to visit for the first time and she hasn’t got a good grasp of how things are. She stayed on the surface, at the side of her local right-wing colleagues. It’s a pity. The chamber of commerce and industry, which happens to have split recently, has only one focus, to increase profits for a minority under the guise of economic development. Many employers earn a lot of money here, but invest this money elsewhere. What are the links between the USTKE, the CGT [General Confederation of Labour, the second-largest main union federation in metropolitan France] and Olivier Besancenot’s New Anti-Capitalist party (NPA)? Strong, fraternal links designed to reinforce our determination to change things. During the last electoral campaign, we chose the slogan ``Another world is on the move’’ because we are people of the land and what we see day after day is nauseating. Wealth is concentrated in the hands of a minority while the majority gets poorer. Most political speeches are deliberately misleading, and in a small country like ours, they are remote-controlled by the employers. What has changed since the Matignon Accords of 1988? The USTKE was the only trade union organisation to have signed the Matignon-Oudinot accords in the person of its founding president, Louis Kotra Uregei. At first these accords were a ``cease-fire’’, which put an end to the events of 1984-1988. For us these accords, followed by those of Nouméa, have to lead to the reconquest of sovereignty. This sovereignty should give us complete authority to manage our country. To choose our systems of social and economic development, health and education. To decide on our international relations. The accords, therefore, have to commit to this direction so that we can build together this multinational country for which we are fighting. But with a very important condition, that of re-establishing the Kanak people to its rightful place as the indigenous people, the only people to be colonised, at the centre of this new country. Unfortunately, many people would still have you believe that independence means poverty, anarchy and the exclusion of those who want only one thing – absolutely nothing to change, because they live well and selfishly. It’s worth mentioning that these moralists don’t stop talking about democracy and freedom in a country where there is only one television channel, belonging to the state, one daily newspaper and five radio stations. In these conditions, how can you imagine any real freedom of speech? I’ve asked for public debates about our approach towards independence with right-wing parliamentarians on television and radio. For the moment, the response is that no one wants to lower themselves to dialogue with us on this topic. I’d also like to say that we’re pro-independence but not anti-French, and this hotchpotch of ideas, still widespread, is unworthy. Are the recent troubles due to the big wave of immigration from metropolitan France that New-Caledonia has experienced in the last 10 years? It’s true, since civil peace has returned to the country, we’ve witnessed a growing wave of immigration from France. The Kanak people and those who have been recognised as victims of history are going to become a minority if nothing is done. We’ve asked for a law to protect these people’s access to jobs. A bill was prepared, but it doesn’t respond strongly enough to our aspirations. When you know about the economic crisis in France and the ease with which those who land here have in finding work to the detriment of the country’s citizens, you can only be shocked. You know, in the tribes or the poor suburbs and squats, Nouméa, the capital, is called ``White City’’ because there are only Europeans there. We’ve got to stop this sort of immigration, whose only goals are the sea, sun and cash. How do you see the situation in the country? If all the desirable skills are transferred before the 2014 referendum, if the fear-mongering stops, if the will to construct a prosperous country within the framework of a real community with a future, through the redistribution of wealth, is effectively put in place, there is every hope of success. In the opposite case, if there’s no emancipation through the reparation of damages due to colonisation, then hope will be in vain. C’est un véritable document que publie Libération : un entretien avec Gérard Jodar, président du syndicat indépendantiste de Nouvelle-Calédonie, l’USTKE (Union syndicale des travailleurs kanaks et des exploités). Condamné à un an de prison ferme, fin juin, pour entrave à la circulation d’un avion, il est l’un des très rares syndicalistes à être emprisonnés en France – le juge d’application des peines du tribunal de grande instance de Nouméa vient d’ailleurs, ce lundi, de rejeter la demande d’aménagement de peine formulée par les avocats du président de l’USTKE. Gérard Jodar explique les conditions de sa détention ainsi que la situation sur le Caillou. Ses proches lui ont fait parvenir les questions que nous lui avons posées par écrit. Je vais très bien car je suis soutenu par beaucoup de militants, par un collectif et par ma famille. Je suis au Camp Est, seule prison du pays, et cette expérience est très enrichissante. Les constats que je fais sont terribles. D’abord, 97 % des détenus sont des jeunes Kanaks. La prison, prévue pour 190 détenus, en compte 417. Nous sommes cinq ou six dans les cellules crasseuses de 11 m2. Nous avons droit à une demi-heure de promenade le matin et l’après-midi dans une petite cour. Il n’y a aucune structure de formation en interne pour permettre la réinsertion de tous ces jeunes détenus. Nous n’avons droit qu’à deux visites d’une demi-heure par semaine. La nourriture est loin de correspondre aux besoins et aux normes. Quand je pense que la France est le pays des droits de l’homme… Bravo ! Il faut qu’une mission parlementaire vienne faire un constat et atteste de ce que je dis. Du côté du personnel pénitentiaire, les choses ne sont pas mieux : sous-effectifs, mauvaises conditions de travail, les gardiens sont découragés. Nous sommes toujours dans une colonie et pas très loin de l’époque du bagne. Nous sommes victimes de l’acharnement de l’Etat au travers de l’action des forces de l’ordre et du parquet de Nouméa. Cela fait deux fois depuis début 2008 que nous sommes chargés par plusieurs centaines de policiers et gardes mobiles, alors que nos mobilisations, dans le cadre de grèves générales licites, étaient pacifiques. Dans le dernier conflit, celui d’Aircal [une compagnie aérienne locale, ndlr], lors de l’assaut violent des forces de l’ordre, nous avons été contraints de nous réfugier à vingt-huit dans deux avions dont les portes étaient ouvertes pour nous protéger et attendre la fin des affrontements. Nous sommes tous passés devant le tribunal, et pour des faits strictement identiques, les condamnations vont de l’amende à douze mois ferme pour le responsable de notre fédération BTP et moi-même, en passant par la prison avec sursis. Ces décisions sont totalement discriminatoires, voire surréalistes. Il n’y a eu aucune instruction malgré la requête de nos avocats, et ce fut un procès exclusivement à charge. En vous maintenant en détention, ne fait-on pas de vous un symbole de la résistance aux autorités et au patronat calédoniens ? Etre un symbole ne fait pas partie de mes ambitions. Je veux être et rester avant tout un militant qui se bat pour plus de justice sociale, pour une juste et effective répartition des richesses, pour le rééquilibrage en faveur du peuple kanak, pour la construction d’un pays multiculturel dans le cadre d’une communauté de destin. Malheureusement, ici, il vaut mieux tenir un discours politicien que faire preuve de sincérité et d’honnêteté intellectuelle. Le patronat, en grande partie, n’aime pas l’USTKE car notre syndicat n’hésite pas à se mobiliser et dénonce la répartition aberrante des richesses. Un quart de la population est en dessous du seuil de pauvreté et une autre partie de cette population vit dans l’opulence et le luxe. Pour le haut-commissaire de la République, Yves Dassonville, « Aircal est un prétexte. Ce qui est fondamentalement recherché par l’USTKE, c’est de créer de la tension ». Que pensez-vous de cette affirmation ? Dans notre pays, il faut que certains arrêtent de fantasmer. Depuis la prison, j’ai entendu tout et n’importe quoi sur ce conflit. Si, comme nous l’avions souhaité, les négociations avaient débuté dès le départ de la grève, et non plusieurs mois après, le conflit aurait été réglé de suite, et rien de ce qui s’est produit n’aurait eu lieu. Mais comme je vous l’ai dit, il ne faut jamais occulter le fait que nous sommes un syndicat indépendantiste et que l’Etat, le patronat et la droite locale ne rêvent que d’une chose, voir l’USTKE disparaître. Là encore, il faut qu’ils arrêtent tous de fantasmer. José Bové accuse Yves Dassonville « de jeter de l’huile sur le feu ». Partagez-vous cette analyse ? Pensez-vous qu’il doive rester en fonction ? En trente ans, je n’ai jamais vu un haut-commissaire donner des instructions aussi brutales et tenir un discours aussi radical sous prétexte de maintenir l’ordre public. Nous ne sommes pas dans un pays de voyous, comme il se plaît à nous traiter. Il n’a pas su tenir compte de la culture du pays et c’est grave. Il est effectivement préférable qu’il soit muté ailleurs et que quelqu’un de plus diplomate prenne sa place. Alors que le conflit s’envenime, on constate une mobilisation des jeunes aux côtés de l’USTKE. Comment expliquez-vous ce front commun ? Je voudrais avant tout dénoncer les propos du haut-commissaire qui a déclaré que l’USTKE enrôlait et armait la jeunesse afin de l’utiliser contre l’Etat et déstabiliser le pays. Encore une déclaration qui illustre bien sa méconnaissance de la réalité. Je voudrais aussi dire que je condamne le saccage et le pillage des commerces ou d’installations publiques. J’ai la chance de fréquenter beaucoup de jeunes : ils ne croient plus à la politique d’aujourd’hui, n’ont plus confiance dans les institutions et n’ont aucun débouché professionnel. Lorsqu’on n’a plus d’espoir dans l’avenir, voire plus d’avenir, eh bien on réagit par réflexe ! On voit des syndicalistes se faire taper dessus par les forces de l’ordre, on entend des discours radicaux tenus à leur encontre, qu’est-ce que se disent alors les jeunes ? Battons-nous à leurs côtés, peut-être que cela créera une prise de conscience qui pourrait apporter un changement des comportements en notre faveur. La jeunesse est l’avenir du pays, ne pas la prendre en compte, c’est ruiner tous les espoirs de vivre un jour dans un pays où chacun aura sa place. Qu’attendez-vous aujourd’hui du gouvernement et de Marie-Luce Penchard, la secrétaire d’Etat à l’Outre-Mer ? Le gouvernement français se doit de respecter intégralement les dispositions de l’accord de Nouméa de 1998. Ces accords doivent conduire à une vraie décolonisation, et il est donc fondamental que la sincérité prévale dans cette démarche. Si le peuple kanak et les citoyens du pays se sentent trahis, leurs réactions seront fortes. Marie-Luce Penchard est venue pour la première fois chez nous et elle n’a pas pris la mesure des choses. Elle est restée dans le superficiel aux côtés de ses collègues de la droite locale. C’est dommage. Quels sont les liens entre l’USTKE, la CGT et le NPA d’Olivier Besancenot ? Des liens forts, fraternels, qui doivent renforcer notre détermination à faire changer les choses. Lors de la dernière campagne électorale, nous avons choisi pour slogan « Un autre monde est en marche » parce que nous avons la chance d’être des hommes de terrain et que les constats que nous faisons jour après jour sont écœurants. L’argent se concentre sur une minorité alors qu’une majorité vit de plus en plus mal. La plupart des discours politiques sont trompeurs, et dans un petit pays comme le nôtre, ils sont téléguidés par le patronat. Qu’est-ce qui a changé depuis les accords de Matignon de 1988 ? L’USTKE a été la seule organisation syndicale à avoir signé les accords Matignon-Oudinot par la plume de son président fondateur, Louis Kotra Uregei. Ces accords ont été dans un premier temps un « cessez-le-feu » qui mettait un terme aux événements de 1984-1988. Ces accords, suivis par ceux de Nouméa, doivent, pour nous, conduire à la reconquête de la souveraineté. Cette souveraineté devrait nous permettre de gérer notre pays en toute responsabilité. Choisir notre système de développement social, économique, de santé, d’enseignement. Décider de nos relations internationales. Les accords doivent donc s’inscrire dans cette démarche afin que nous construisions ensemble ce pays multiculturel pour lequel nous nous battons. Mais avec un préalable très important, celui de restituer au peuple kanak sa place légitime de peuple autochtone, seul peuple colonisé, au centre du nouveau pays. Malheureusement, beaucoup trop de gens encore font croire que l’indépendance, c’est la pauvreté, l’anarchie, l’exclusion de ceux qui ne veulent qu’une chose, que surtout rien ne change, car ils vivent richement et égoïstement. Il faut aussi dire que les donneurs de leçon n’arrêtent pas de parler de démocratie et de liberté dans un pays où il n’y a qu’une chaîne de télévision, appartenant à l’Etat, un seul quotidien et cinq stations de radio. Dans ces conditions, comment pouvez-vous imaginer qu’il y ait une réelle liberté de parole ? Alors bien évidemment, les responsables politiques de droite en profitent pour diffuser un discours systématiquement basé sur « heureusement que nous sommes français, sinon !!! » J’ai déjà demandé des débats publics portant sur notre approche de l’indépendance avec des élus de droite sur le plateau télé de RFO ou sur les ondes radio. Pour l’instant, on nous rétorque que personne ne veut s’abaisser à dialoguer avec nous sur ce thème. Je voudrais aussi dire que nous sommes indépendantistes mais pas antifrançais, et cet amalgame, encore trop utilisé, est indigne. Les récents troubles sont-ils dus à la grosse vague d’immigration métropolitaine que la Nouvelle-Calédonie connaît depuis dix ans ? Effectivement, depuis que la paix civile est revenue dans le pays, nous assistons à une vague de plus en plus importante d’immigration en provenance de France. Le peuple kanak et ceux qui ont été reconnus comme victimes de l’histoire vont devenir minoritaires si rien n’est fait. Nous avons demandé qu’un texte soit voté pour protéger l’emploi en faveur de cette population. Un texte a bien été préparé, mais il ne répond pas assez fortement à nos aspirations. Quand on connaît la crise économique que traverse la France et la facilité avec laquelle ceux qui débarquent arrivent à trouver du travail au détriment de ceux qui sont citoyens du pays, on ne peut qu’être choqué. Vous savez, dans les tribus ou les quartiers populaires et les squats de Nouméa, la capitale est appelée « Ville Blanche » parce qu’il n’y a plus que des Européens. Il faut stopper cette immigration qui n’a comme but que la mer, le soleil et le fric. Comment voyez-vous la situation dans le pays ? Si toutes les compétences régaliennes sont bien transférées avant le référendum de 2014, si les discours de la peur cessent, si la volonté de construire un pays prospère dans le cadre d’une réelle communauté de destin par le rééquilibrage est effectivement mise en œuvre, tous les espoirs sont permis. Dans le cas contraire, faute d’émancipation par la réparation des dommages dus à la colonisation, l’espoir sera alors vain.